Eurocash Group’s revenue for the first nine months of 2018 exceeded PLN 17 billion and was 9% higher than in the same period of 2017. The wholesale segment saw improved results: sales in the year’s first three quarters grew by 6% y/y to PLN 13.4 billion, while EBITDA reached PLN 291 million, denoting 22% growth y/y. Retail-segment sales in the first nine months of 2018 surpassed PLN 3 billion, up by 18% y/y. EBITDA reached PLN 63 million, compared to PLN 106 million in the preceding year. The lower profitability in retail was due to costs related to the integration of the acquired supermarket chains EKO and Mila. A fresh product delivery project, which is being developed by Eurocash Group and is of key importance to strengthening the competitive position of independent retail stores, contributed PLN 452 million in revenue in the period from January to September 2018, breaking even in the third quarter – much sooner than initially expected. Normalised EBITDA (adjusted for one-off costs) for the entire Eurocash Group after the first nine months of 2018 was PLN 265 million, up by 2% y/y. Normalised consolidated net profit for the first three quarters of 2018 reached PLN 59 million, compared to PLN 75 million in the previous year. The lower net profit was mainly due to an increase in depreciation costs (mainly in the retail segment) as well as growth in finance costs and a higher effective tax rate. In Q3 2018 alone, net profit reached PLN 38 million, up by 2% from the same period of 2017. Eurocash Group’s business is characterised by strong positive cash flows from operating activities, which in the first nine months of 2018 reached PLN 301 million, including PLN 115 million in the third quarter. This made it possible to reduce net debt as of the end of September by PLN 77 million, compared to the end of June 2018, and the net debt ratio to 1.67x EBITDA (from 1.9x EBITDA in the previous quarter). “Small-format stores, which are Eurocash Group’s main customers, are doing better than the entire FMCG industry on average. Total small-format sales in the first nine months of 2018 went up by 6.3% y/y. Sales in our wholesale segment grew at a similar pace. What is especially pleasing, the growth in wholesale-segment sales is accompanied by improvements in efficiency, which translated into 22% growth in EBITDA in this segment,” noted Jacek Owczarek, CFO and member of Eurocash’s management board. 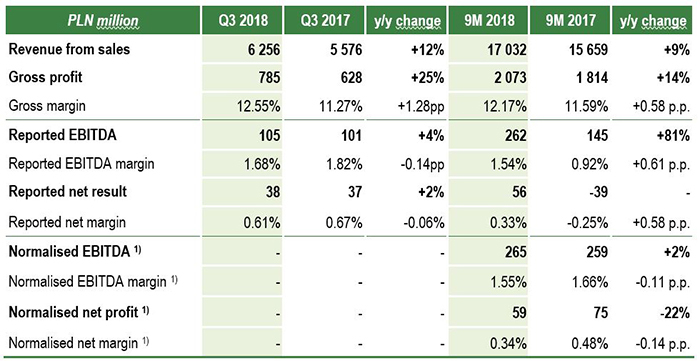 In the third quarter of 2018, like-for-like sales at Eurocash Cash & Carry wholesalers grew by 3.8% y/y, and by 2.8% y/y in the first nine months of 2018, which is this format’s best result in five years. The very good results in the wholesale segment in this year’s first three quarters were driven by an 11% growth in the active distribution format (Eurocash Dystrybucja), including more than 10% growth in sales to customers in franchise and partner networks such as Lewiatan, Euro Sklep, Groszek and PSD (Gama). The launch of eurocash.pl – the largest e-commerce platform for independent retail in Poland – was also an important event in Q3 2018. “This is an innovative and unique B2B platform in our industry. Another breakthrough tool thanks to which independent retailers can effectively compete against discounters and other large-format stores. The platform is available to Eurocash Dystrybucja’s customers since September and will be available to the customers of Eurocash Group’s other business units from next year,” said Jacek Owczarek. In the first nine months of 2018, Eurocash Group’s retail segment grew its revenue by over 18% y/y to more than PLN 3 billion, mainly due to the consolidation of the Mila chain, the acquisition of which was finalised in May. “Mila contributed PLN 466 million to our reported sales. If Mila’s sales were included from the beginning of the year, the retail segment’s pro forma sales would have exceeded PLN 3.6 billion, up by 41% from the previous year,” said the Eurocash board member. “Thanks to this acquisition and the earlier acquisition of EKO, the proximity supermarket chain that we are building already comprises over 1500 locations, including our own stores and Delikatesy Centrum franchise stores. This and next year will be affected by integration of the acquired entities. Aside from rebranding, which is accompanied by store remodeling and renovation, we are integrating logistics, administrative, operations, pricing and assortment policies. Integration costs are naturally weighing on the present profitability of the retail segment, but they are necessary in order to ultimately bring the entire chain’s efficiency to a level similar to that achieved by Delikatesy Centrum stores,” added Jacek Owczarek. Eurocash Group’s profitability is also being negatively affected by the Projects segment, which covers investments in the development of innovative retail formats such as Duży Ben (alcohol shops), abc na kołach (mobile grocery stores) and Kontigo (cosmetics stores) as well as the development of high-quality fresh product distribution. The segment’s negative impact on EBITDA in Q1-Q3 2018 was PLN 7 million (17%) lower than in the same period last year. “The fresh product delivery project that we are developing will considerably strengthen the competitive position of independent retail stores. This project contributed PLN 452 million in revenue in the period from January to September 2018 and broke even in the third quarter – much sooner than initially expected,” Jacek Owczarek emphasised. The execution by Eurocash Group of a preliminary agreement to sell a 100% stake in PayUp Polska, which manages a network of payment terminals installed in retail stores throughout the country, was another important event in the third quarter of 2018. Finalising the transaction will have a positive impact on the Group’s financial results. The price for the 100% stake in PayUp Polska was set at PLN 110 million, although the final price may be adjusted subject to PayUp reaching certain financial parameters. In 2017, PayUp Polska’s separate revenue (without taking IFRS 15 into account) exceeded PLN 440 million, while EBITDA reached PLN 5.8 million. “PayUp is getting a strong strategic partner – Polskie ePłatności, which will ensure the company’s further development. 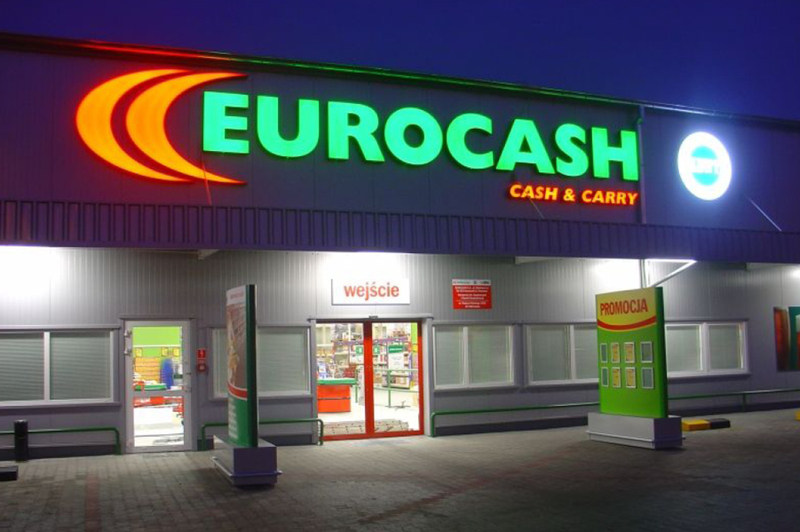 Eurocash Group on the other hand will focus on its core business and the development of new projects to support the competitiveness of independent retail in Poland,” summarised Eurocash’s CFO. Eurocash Group is the largest Polish business operating in the wholesale distribution of food and in providing marketing support to independent Polish retailers. The franchise and partner chains supported by Eurocash include over 15,000 independent stores operating under brands such as abc, Groszek, Delikatesy Centrum, Lewiatan, Euro Sklep and Gama.